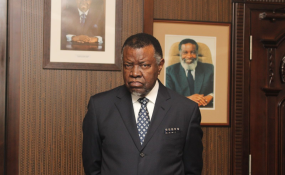 An irritated president Hage Geingob "yelled" at his top administrators last year after they informed him about a proposal to install an elevator at a state-owned house occupied by former vice president Nickey Iyambo. Several months later, that elevator was installed, a clear-cut sign that officials had ignored the president, a person familiar with this episode told The Namibian over the weekend. This defiance prompted State House to investigate and to possibly charge the culprits after weeks of living in denial. A source said a Chinese company illegally installed the N$1 million elevator at a house situated in Eros in Windhoek two weeks ago. The Namibian was tipped off about the Chinese connection a day after the paper first reported last month that senior government officials had discussed a proposal to install a N$2 million elevator at the state-owned house occupied by Iyambo. Initially, Geingob was allegedly annoyed about that article because it made it appear as if the elevator tender was still being considered. Geingob believed at the time that this case had been closed since he had instructed his top officials not to go ahead with the project. A person briefed about this matter said Geingob fumed at Samuel /Goagoseb - the permanent secretary to the president at the time - last year for entertaining this tender. Even presidential affairs minister Martin Andjaba denied the elevator story last month when asked by The Namibian, saying "there will never be plans to upgrade the house". It turned out that the elevator plan was still on the cards, and it was installed two weeks after The Namibian had published the story. The Presidency issued a statement on Friday, admitting that "shockingly", the elevator was installed, but it was illegal since no decision was made to install any elevator at the house. "Regrettably, unprincipled officials hastily and clandestinely installed the elevator between 1and 8 April 2019, without consultation and prior knowledge of senior management in the Presidency," State House spokesperson Alfredo Hengari said in a statement. He said senior officials in the Presidency concluded that the elevator installation at the house was illegal. "The installation was carried out without due authorisation and respect for procurement procedures," he added. Hengari said: "Geingob has repeatedly instructed government officials to do more with less, and not to engage in frivolous or unauthorised spending of government resources". According to him, officials who illegally installed the N$1 million elevator will be charged. "President Hage Geingob mandated management in the Presidency, acting in close collaboration with the secretary to Cabinet George Simataa, and the executive director in the Office of the Prime Minister, to do everything possible to identify the culprits, and lay charges in accordance with the applicable laws of the Republic of Namibia," Hengari stated. The spokesperson said: "Those implicated, whether in government or the private sector, will be prosecuted accordingly, and made to pay for this illegal expenditure". Hengari described the defiance by certain State House officials as "unauthorised, unprocedural and illegal [which] seeks to tarnish the commitment of president Geingob to effective governance". "Irrespective of the underlying reasons and motivations of these individuals, their actions are clearly illegal as they were not authorised, nor did they follow the laid-down mandatory procedures of procurement, which serve as checks and balances to prevent illegal, unauthorised expenditure," he continued. It is still unclear which officials will be held accountable for this saga, but some suspect that investigators could question former permanent secretary in the Presidency /Goagoseb, who was the chief administrator at State House. /Goagoseb, who was appointed Namibia's ambassador to Cuba last year, was unreachable for comment. State House did not respond to questions about Geingob being irritated by his officials who, for decades, used "national security" as smokescreen to push through secretive and questionable tenders. Former vice president Iyambo was also unreachable for comment. Iyambo's accommodation came under scrutiny after presidential affairs minister Andjaba announced in parliament last month that the government had offered the former vice president a house as a temporary measure. The house was offered to him after he moved out of another state-owned house following his replacement by Nangolo Mbumba as vice president in February last year. Iyambo, who was forced to step down due to ill-health, temporarily returned to his private house in Eros. But sources said he informed the government that he wanted a temporary residence while he renovated that house. The Namibian understands that Iyambo's children are staying at his private house, while he stays at the state-owned house where Geingob stayed when he was prime minister. The house was renovated with taxpayers' money, and allocated to Iyambo. Iyambo is said to have complained to State House about the stairs at the house. That is when State House officials called for companies to bid for the elevator tender. One of the companies asked N$2 million for the job. Sitting vice presidents under the Presidential Remuneration and other Benefits' Act get almost everything for free. The perks for retired vice presidents, however, are not clarified by law, leaving a loophole for abuse. Iyambo earned N$1,5 million per year as vice president, with a string of benefits extended to his family.